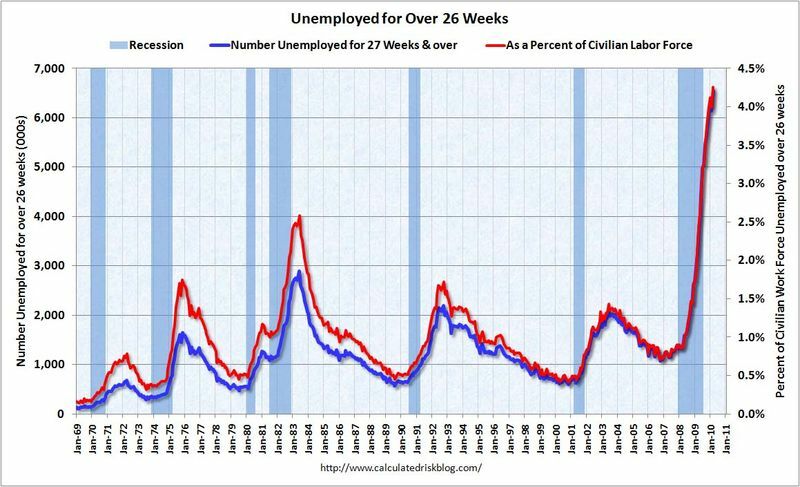 The number of long term unemployed is one of the key stories of this recession. Although the headline number of 162,000 payroll jobs was a positive (this is 114,000 after adjusting for Census 2010 hires), the underlying details were mixed. The positives: the unemployment rate was steady, the employment-population ratio ticked up slightly (after plunging sharply), and average hours increased (might have been impacted by the snow in February). But a near record number of part time workers (for economic reasons), a record number of unemployed for more than 26 weeks, and a decline in average hourly wages are all negatives. The average length of time the jobless have been out of work has reached 31.2 weeks in March. That’s the longest average jobless period since the government began collecting such data in 1948. Not a happy thing to read on any Friday.